The governments of Britain and Ireland have proposed the first formal border checks for more than 80 years. A Home Office paper will propose substantial changes to the passport free zone called the Common Travel Area. The identity checks would involve a full passport inspection with airlines and ferry operators facing fines if they carry passengers who do not have the appropriate documents. 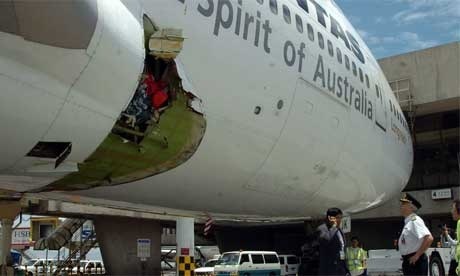 Safety engineers looking at the Qantas plane which developed a hole during flight have ruled out corrosion. Other possible causes might include accidental external damage to the plane on the ground, or something inside the plane which had not been properly secured moving around during the flight. Investigators are still looking at the incident to determine what caused the hole. If you are heading to the Mediterranean this summer you might want to watch out for jellyfish. Some areas are experiencing problems with the mauve stinger jellyfish. There have been reports of tourists being stung in the stretch of coast between Nice and Cannes and the problem is also affecting the Cote d'Azur, the west coast of Italy, Sardinia and parts of Spain. The sting of the mauve stinger jellyfish can cause severe burns and in some cases can cause scarring to the victim. So if you see them, its best to stay out of the water. This weeks travel blog of the week is Traveling Mamas. The blog as its title suggests is written by a a group of mothers and offers tips and advice about places to visit with children. One recent article looks at the San Diego Omni hotel. The hotel gets a good review due to its family friendly approach. On arrival the children were presented with some children's backpacks which contained a various delights such as glow in the dark gummy worms, bracelets, a kaleidoscope and a children's cup which gives them free refills in the hotels restaurant. Cleverly the backpacks give the adults in the group much needed time to settle into the hotel and unpack whilst the children are exploring what is inside them. The hotel also gets the thumbs up for its fantastic kids menu and for the packages it provides such as the Seaworld family package which includes accommodation, breakfast and Seaworld tickets. This blog doesn't just concentrate on vacations for the whole family it also looks at other types of holidays such as romantic getaways. This article looks at how to survive your wine tasting and suggests the Napa Valley as a great destination to visit. It has a few humorous tips including "Don’t get angry when someone says “that’s a big nose” - they are referring to the aroma of the wine, not you" and "When the pourer suggests you may want to spit, you want to do it in the slop bucket, and not at the other tasters." All very good advice and sure to make your first wine tasting pass without incident. The world's largest aircraft model has been unveiled at the approach to Heathrow. It is a replica of an Airbus A380 and weighs 45 tonnes. The model has a wingspan of 28.5 yards, it is 26.2 yards long and took 18 months to build. It will take the place of the model Concorde which previously stood in the space but has now been moved to the Brooklands Museum in Weybridge. The model Airbus is due to remain on the site until 2013. A Qantas plane was forced to make an emergency landing after a hole appeared mid flight. The plane was carrying 350 people at the time on a journey from London to Melbourne when part of the fuselage broke away leaving a four metre hole in the side of the aircraft. The damage caused a drop in cabin pressure and the oxygen masks were deployed. The pilot managed to control the aircraft and land it safely. The incident is not being investigated to find out what caused it. A firm of engineers have unveiled a plan that would enable passengers to take a high speed train from Heathrow directly to the continent. The scheme would involve extending the high speed rail link from St Pancras to Heathrow. If the scheme were to go ahead it would cost around £4.5 billion and could be completed by 2019. MPs have approved a bill which will se the £16bn Crossrail scheme go ahead. The rail scheme will link Maidenhead in Berkshire to Shenfield in Essex via Heathrow. Under the scheme a number of new stations will be built. The first trains are expected to start running in 2017 and are expected to carry 78,000 passengers an hour during peak times. A North Yorkshire post office will close following a public consultation. The branch in Aspin Lane Knaresborough will close by the autumn. This is despite a petition signed by thousands of people who wanted to save it. Post Office bosses have said they will provide an outreach service in the area. This article suggests that an increasing number of British families are now taking their summer holiday in the UK. The main factors influencing their decision seems to be that they are trying to save money and also avoid delays and problems at the UK's airports. Whilst people still appear to be booking short haul holidays to places like France, Malta and the Canaries customers seem to be steering clear of long haul destinations. Qantas Airways have announced that they will cut 1,500 jobs worldwide and abandon plans to create 1,200 new jobs. The move has come as the company tries to deal with high fuel costs. The losses will include closing call centres in Tucson, Arizona and London with the loss of 99 jobs. Around 1,300 jobs will be lost in Australia with the rest overseas. The airline is also scrapping plans to increase its capacity by 8% in the 12 months to mid 2009 as they are not expecting any growth in that period. This weeks Travel Blog follows Jon and Jacky as they travel around for three months on their honeymoon. Their journey started in May when they visited Vietnam. One of the posts from their time there shows some of the interesting items of sale, such as th ese snakes and scorpions in a jar (right). They also show some of the more unusual food on offer, such as this elephant ear fish (left) which although ugly is apparently perfectly edible. Another post finds them in Singapore visiting the Singapore Zoo. The title of the post "If Carlsberg made zoos" says it all. None of the animals at the zoo are in conventional enclosures giving an altogether more close up experience as you can see by this picture (right) of crocodile feeding time. The most recent posts find the couple in New Zealand. A few highlights include the ice bar. A bar that is basically an -8 degree room where all the chairs, bar and glasses are made of ice. Another post finds them visiting a glacier and walking around the ice caves and another recent post shows these rather unusual limestone rocks (right). This article suggests that landing slots at Heathrow are so valuable that it can take companies years and millions of pounds to get just one aircraft into the airport. Heathrow is constrained in the number of flights that it can accommodate meaning an airline wanting to set up operations there can pay up to £30 million for take off and landing times. As a result the landing rights are sometimes more valuable than the airline themselves. The companies must continue using the slots otherwise they will lose them. This means that many airlines will continue flying even if its planes are virtually empty. The cost of sending a text message back home whilst in Europe could come down by as much as 70%. Currently sending a text message from Spain would cost around 40p but under new rules it could cost as little as 9p. The cuts have been proposed by the EU Telecoms commissioner who has accused mobile operators of failing to offer customers a fair deal. From October she will introduce new legal rules that will put a cap on charges. Her proposals first need to be approved by ministers of the EU member states before they become law. Ryanair has announced cut backs of the number of winter flights from Stanstead. It plans to reduce the number of flights by 14 per cent meaning the number of weekly flights will be cut from 1,850 to just 1,600. The plan is part of an effort to try and reduce losses and comes after a similar announcement from BA. Despite the fact that prices of holidays seems to be more expensive at the moment due to fuel surcharges, there are still some good deals to be had if you look around. One option that is worth looking at is a holiday apartment rather than a hotel. This website for example has some good deals on Barcelona apartments. The advantage of booking a holiday apartment is that it can often work out cheaper choosing the self catering option. Holiday apartments in Catalonia start from as little as £350 a week based on a 1 bedroom apartment near the city centre and according to this article August is a good time to visit Barcelona as many Spaniards choose to go on vacation so the city is quieter and Spanish apartments are often cheaper at this time of year. Barcelona like Paris has a discount card that you might want to purchase to save a bit more cash. Not surprisingly it is called the Barcelona Card. It offers free travel on public transport, free offers at museums, leisure facilities, nightclubs, shops and restaurants. You can purchase the card for 2,3,4 or 5 days depending on the length of your stay and it also comes with a handy information guide. BA will cut capacity on winter flights by up to 5% in an effort to avoid losses. They will reduce the amount of flights on its routes and axe some service between October and March. There will be fewer services on the least cash generative routes with no more than two out of 154 routes being axed. Many airlines are currently cutting capacity due to falling demand and high fuel prices with US carriers leading the way. There are signs that the slowing economy is starting to affect travel with BA seeing a decline of 3.7% or 87,000 fewer passengers in June. If you were hoping to get tickets for next years T in the park festival then you may already be too late. The first batch of tickets sold out in less than 10 hours as music fans rushed to snap them up. For those you missed them there will be another chance to get a ticket when the line up is announced early next year. This week's travel blog of the week is 3 Go Global, yet another blog started by someone who decided to pickup sticks and explore the world with their children in tow so they could say "I did that!" One interesting article I found was about their trip to Bangkok watching an "horrific" display of a mongoose attacking cobras that were dropped into its glass cage (the snakes were later prized from its jaws). However my favourite part was the visit to the Tiger Temple where tigers sit sprawled out unconcerned by the tourists gauping at these larger than life creatures lazing in the sun. Boris Johnson has quashed the proposed rise in the London congestion charge. The former mayor Ken Livingston has planned to raise the daily charge from £8 to £25. Boris Johnson has said that the £25 charge would hit small businesses and families the hardest and this is why he is scrapping the rise. He also said that his aim is to achieve a "fairer and more effective congestion charge". PC2Paper have recently added a new message area to users accounts. For some time we have been having problems contacting customers by email, either due to us having an invalid address on file or the fact that many of our emails are picked up by our customers spam filters. We hope that the new message area will allow us to contact customers more effectively without having to worry about whether our emails are getting through. If you receive a message from our the PC2Paper customer service team, this will be the first thing you will see when you log into your account. We will soon start using this area to alert customers to any problems related to letter sending and also to send any tracking numbers for recorded and special deliveries. The Post Office has released a list of branches which are likely to close in Bedfordshire, Hertfordshire and Milton Keynes. The Post Office has said that the cut backs are necessary to make the service sustainable. It is part of a wider proposal to reduce the number of branches by 2,500 nationwide. A public consultation will now open on the proposed closures. The full list of closures is below. This weeks Travel Blog of the Week is Born to Travel written by Sharon and Scott. 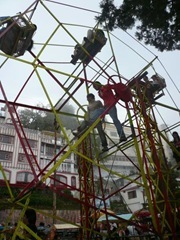 The blog follows their various travels around the world with the most recent posts finding them in India. One post charts a bus trip to the town of Keylong where the driver negotiates the precarious mountain road whilst holding an animated conversation with the conductor complete with wild hand movements. It all sounds rather scary and the y post a picture (right) of what can happen if you go off the edge. Luckily they arrives at their destination in one piece despite feeling the effects of altitude sickness - lethargy, nausea, and headaches. Another post is about another bus trip. 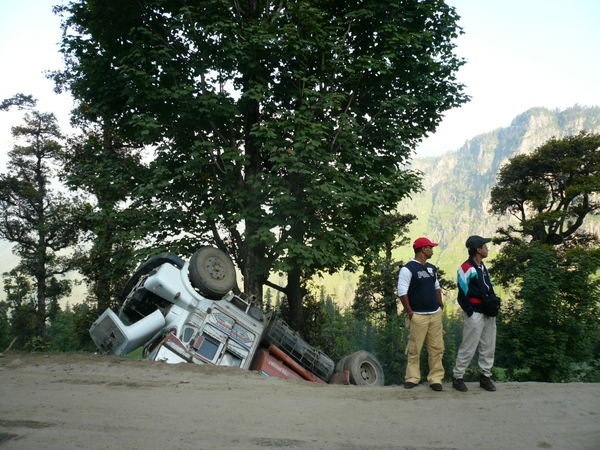 On this one, however, the couple decided to get off as the bus in question had no brakes despite being about to negotiate the same precarious mountain roads. Despite this it appears that the local people, perhaps hardened to the conditions of the road and the transport were happy to stay on the bus and continue their journey. A third post shows something that you could surely only find in India a man powered Ferris Wheel (left). You have to see it to believe it. These are just a few highlights from this great blog, but its well worth checking it out yourself for more great posts. Exeter International Airport has unveiled expansion plans. Under the plans the airport would expand to include more destinations and would make improvements to taxiways. The plans could increase on site jobs from 1,400 to 3,550 by 2030 with the local economic contribution rising from £105m to £264m over the same period. However, Friends of the Earth have said that plans to increase annual passengers number at the airport are bad for the environment and that any economic benefit would be outweighed by the effects on climate change. The plan is open for consultation for three months. It has been announced that injured war veterans will get free travel on London transport. Boris Johnson made the announcement last week on Veterans Day. The scheme will come into effect on the 2nd of November and will benefit an estimated 2,600 war veterans living in London. If you don't fancy dragging heavy bags around when you travel then you might be interested in this new suitcase. It has an "anti gravity" system that distributes the weight over the wheels making the case feel lighter. The system can make pulling 30kg of baggage seem like just 3kg. The case does have a flaw, however. It weighs 10.kg when empty which is quite a lot more than the average suitcase. With strict baggage restrictions at airports this could be a disadvantage and mean you have to pack a lot less luggage. At £700 its also quite expensive.